Sustainable Motherhood: We "know" HFCS Makes Rats Fat...So Now What Do We Put in the Easter Basket? 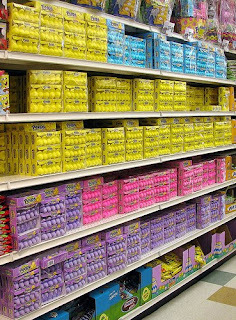 We "know" HFCS Makes Rats Fat...So Now What Do We Put in the Easter Basket? I was inspired to write when traffic spiked this week with the release of the Princeton Study on high fructose corn syrup. While the study only confirmed what I've thought to be true for a while, I was intrigued by Marion Nestle’s post on Food Politics. She took issue with many points in the study and then one of the investigators actually took the time to comment on her post and provides his explanation. In the end it left me more confused but still believing that there is a strong case for eliminating HFCS from your diet. In fact, I think Marion Nestle was only refuting the fact that sugar is any less bad for you…so she would ultimately tell us to skip the sugar, organic or cane or corn based and fill the basket with fruits, vegetables, books and maybe a little dark chocolate but being a bit more of a traditionalist I thought I would share some of my favorite ways to leave the peeps on the shelves. For more on this see 100 Ways to Kill a Peep. Sjaaks has a good selection of chocolate bunnies and eggs although they are selling out fast. The Natural Candy Store has bunnies and jelly beans. Another easy favorite are Annie's Gummy Bunnies and a good staple for lollipops and hard candies is Yummy Earth. ...and if you just can't live without the annual cream egg here is a recipe for one you can make at home from Very Vegan Holiday. So now you have your candy what should you put it in? We've been using a pastel metal bucket for a few years now and we just put it out at night and then the Easter Bunny fills it. If you don't have one on hand you can go eco and purchase Recycled Newspaper Baskets from Drugstore.com or if you have time and old magazines on your hands How About Orange has instructions for making your own baskets from recycled magazines. As for grass, colored construction paper cut into strips makes for great grass and you won't end up finding random pieces of it all over the place for the rest of the year. We do always TRY to go light on the candy a heavy on the gifts so here are a few of my perennial favorites. 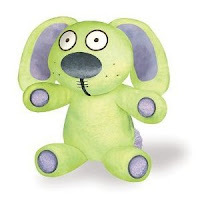 Knuffle Bunny Plush and of course Knuffle Bunny by Mo Willems. 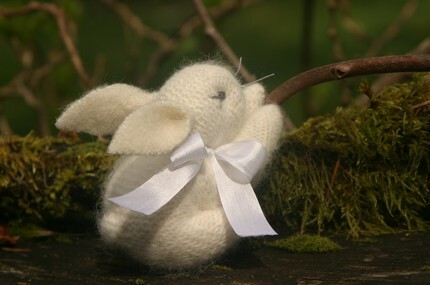 Then this year I've discovered several cute Easter basket stuffers on Etsy. 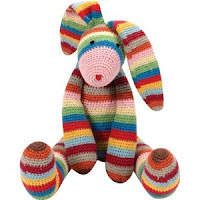 My favorite is Wool Crazy's Pocket Bunny. Some old standards include Crayola Egg Crayons and The Velveteen Rabbit and finally if you are into the Easter Egg Tree here is another Etsy find by Drops Design. For more on how to eliminate high fructose corn syrup read this post. Oh my! I got sucked down the rabbit hole of the Peeps gore. :-) Who knew there were so many options. And we were just using a boring ol' microwave. Great post. I couldn't agree with you more (about the corn syrup and gift giving, that is). These are some great ideas. Thanks!